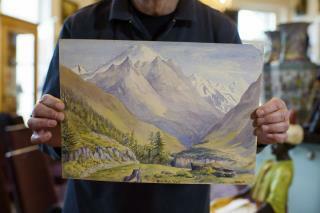 (Newser) – Five watercolors attributed to Nazi dictator Adolf Hitler from his early days as a struggling artist have failed to sell at auction in the southern German city of Nuremberg, possibly over fears they could be fakes, reports the AP. The Nuremberger Nachrichten newspaper reported Sunday that no bids were received on the paintings, which had starting prices of between $21,500 and $50,900. That isn't to say there isn't a market for the real deal: "We are negotiating the past, in this case German past and Nazi memory, which is embodied in Adolf Hitler," two German art historians tell CNN. "Something that has been taboo in the past, now pops up—there are collectors who love to buy these objects." I have Hitler's iPhone. Any offers? Wait, theyre not selling because they might not be authentic??? THAT's why?? wow.